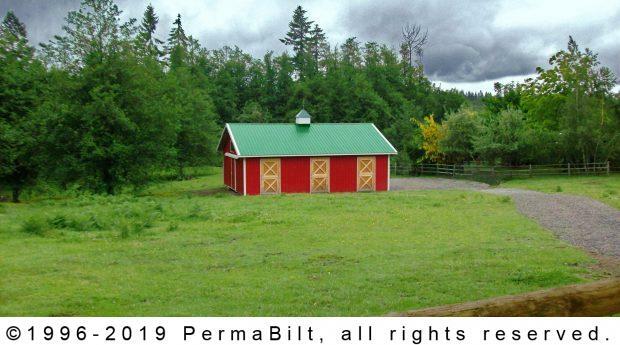 From large arenas to small horse stables, PermaBilt® is western Washington’s leader in equestrian post frame construction for horse pole barns. Every equine facility will accommodate and incorporate the exacting quality that has gone into our buildings since 1973. And when we build stables, we keep both horse and owner’s comfort in mind. This is exactly what our Sequim Washington customer had in mind when she decided to work with us. She needed a small barn to accommodate her three horses so she worked with her PermaBilt® Building Representative in working on the design and was very particular about every element. For example, to give her horses some natural light in the early morning, our customer added in a 2’ poly eave-light running the length of the barn. For much needed ventilation, she added in a cupola with rooster weather vane. For horse access from their stable to their fenced-in paddock, she added three 4’ x 8’ unpainted wood Dutch doors with four 8” galvanized T-hinges, one galvanized barrel bolt and one galvanized gate latch and one galvanized hook and eye latch. All these added details gave her the needed comfort that she had bought the best home for animals.